Android and iPhone users download a similar number of apps every month and spend a similar amount of time using the apps. iPod touch users download an average of 12 apps a month, 37% more apps than iPhone and Android users. webOS users downloaded fewer total apps per month, relative to iPhone OS users and Android users. This may be related to the fewer number of apps in the webOS App Catalog. As always, it%u2019s important to take methodology into consideration when reviewing the results of any survey. You can find more details on our methodology in page 3 of the report. One thing to note is that many of the survey respondents were sourced through in-app ads, which could have resulted in a selection bias of active app users. Also note that we did not include RIM users in the survey, because AdMob does not currently serve ads into Blackberry apps and we wanted to be able to compare similar methodologies across platforms. You can find all of the data from the previous survey here or download the July 2009 Metrics reports for the highlights. Email your comments on the report to metrics@admob.com. Statistics for mobile users is in for January 2010! Interesting trends arise… Did you know the iPod Touch is heavily used by the 17 and younger crowd? Download the full report for details! As you all know, I love numbers, patterns, and reading data. 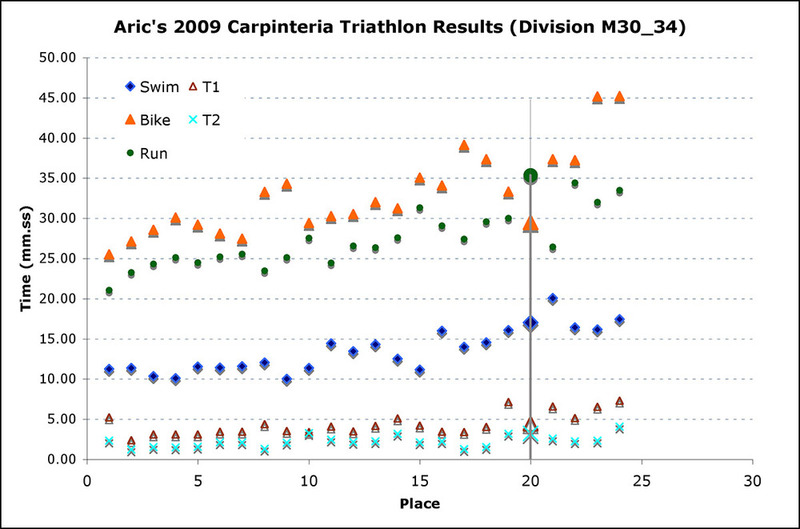 I recently reviewed my most recent triathlon division results on a chart and found some interesting patterns. Check it out at my triathlon training blog, Aric In Training. What Do You Know When You Don’t? Knowing something is half the battle. Communicating that something is the other half, but that is the subject of another post. Knowing how your customers use your product and how they want to interact with you is a great thing. Two major steps toward becoming customer oriented. But then you realize that what you know, might not be what you know. You see signs that your data may be incomplete or inaccurately measured. What do you know now? 1) You need to stop and reevaluate what you know. 2) Depending on the issue, you might be realizing that what you know, might be valid to some degree. 3) On the other-hand, you might be realizing that an entire rebuild of the data warehouse is in order. 4) You start making a mind map of the situation to visualize the scope of the problem. 5) You start counting the knowns, the unknowns, the could-be’s and the what-if’s. 6) You then start to think that maybe if you ignore it, it might, with a one in a trillion chance, actually fix itself. In the end you may know much more than when you started. But the process of determining what you don’t know and what you do know is a great one! It is called validation. Everyone should have a process of validation. Metrics are the individual numbers that relate to other numbers that tell a story. Often, these are the numbers that people of all levels of the company use to make decisions. If a company has a firm grasp of their metrics, fully understand their engine, and have reporting in the right places, there can be some pretty impressive looking dashboards available that tell the health of business at a glance. However, those fabulous looking metrics and dashboards might be completely meaningless if the there is a broken link between the customer touch point and the data server. As companies grow, data grows exponentially and marketing landing pages pile up on the server, there is more and more potential for something to break. Undetected breakage can kill a company! The best way to resolve this is to assume that the entire system is broken and one must test, test, and test again. Keeping records at the major data transfer points is one way to keep track of records dropping out and why. Doing routine quality checks on the data is also a way to keep confidence levels up. Knowing the data, the trends, and the engine is a great way to detect breakage. If sales from search take a dive and they have been consistent for the past three years, maybe something broke… maybe your campaigns need a refresh. A good analyst usually has great instinct on the issues. Patience in drilling down, slicing and dicing, and becoming intiment with your data is the only way to understand it, make sure it works, and that the story is non-fiction as opposed to some strange, poorly written fiction novel. How confident are you in your metrics? Is it fiction or non-fiction? “Self Data” is my term for any data set that I collect about myself. From financial statements, to trips to the bathroom to how much each meal costs, they are all data sets that have interesting patterns. An extra special data set I have are the results of my VO2 test that helps my track my fitness level. From the first test to the second test, I about doubled my caloric burn rate and dropped my VO2 max by 15%. I had made great strides in terms of fitness. This is why tomorrow morning’s test is so exciting to me. How much further have I improved over the past year? Can’t wait to see the impact of my behavior on this metric.